Hasselback chicken is named after its place of origin, the Hasselbacken hotel in Stockholm. The name now simply refers to the way the chicken is cut and stuffed; slices down the chicken breast, almost all the way through but not completely and stuffed with filling in each slice. The possibilities for the chicken stuffing are endless, however, this recipe has a simple and delicious stuffing that compliments chicken perfectly. After you have mastered the technique, try changing the cheese or using a different vegetable to stuff your chicken. Due to the ease of this recipe, it is surely going to become one of your go-to dinners! Place the olive oil and diced garlic in a sauté pan and heat over a medium flame to allow the garlic to brown. Add the spinach to the pan and cover, allowing the spinach to steam and wilt. Set aside and allow to cool. Dice the cheddar cheese into small squares. Slice the chicken down the whole chicken breast using a sharp knife- do not cut all the way through the chicken as you want the chicken to stay together. Move the chicken breasts to a tray lined with foil. Stuff each slice in the chicken with the spinach and cheddar filling. Sprinkle with the black pepper, salt and paprika and Bake in a 350 ̊F oven for 25 minutes. -Try using feta cheese instead of cheddar cheese for a creamier option. -After the chicken if done cooking, sprinkle with more shredded cheddar cheese and place under a broiler to brown for a super cheesy chicken. 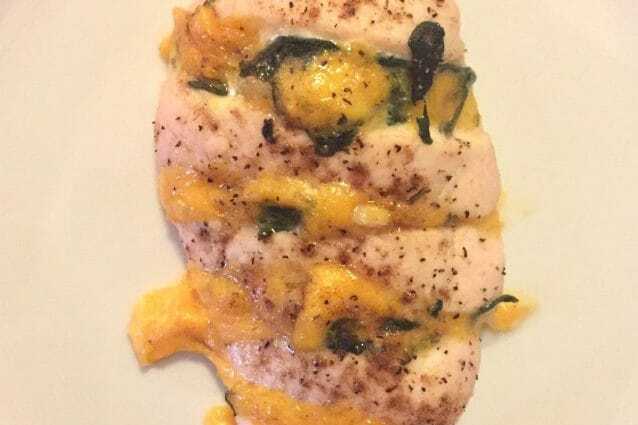 Hasselback chicken ideas: the best of! Spinach and ricotta Hasselback chicken: a unique and tasty recipe!